People congregate by fireplaces and around fire pits. 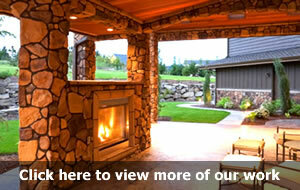 Outdoor fireplaces are a magnificent and beautiful feature in any landscape. They can be integrated with an outdoor kitchen adjacent to the dining area, freestanding in the landscape with a lounge area, or built as part of a patio or porch wall. Outdoor gas fire pits have grown quickly in popularity because of the low cost, low profile, and small area they require but still offering a perfect evening gathering area. Fire pits can be custom built into your patio area or they can be purchased in pre-fabricated kits for gas or propane. Some fire pits can be used for rotisserie and skewer cooking.